If you drive past Alejo’s, guarantee you will not look twice. It’s not only easy to miss, but from the outside it looks like one of those spots you would be skeptical to eat at. It is in a tiny stip mall next to a 7/11, and if I hadn’t been recommended to go to this place, I would have never gone anywhere near it. When I told you I would introduce my blog followers to HOLE IN THE WALLS with amazing food, this place goes to the top of my list. I couldn’t describe it much better than that- it’s a tiny hole in the wall that is PACKED with people, and the food is delicious. After being a little skeptical looking at the outside of the restaurant, I decided to trust my friend who swore by this place. I opened the door to walk in, and the place was packed- no tables available. We didn’t have to wait long though, the service was fast and efficient and when a party of four left, our table was ready in 2 minutes. Alejos is loud and the tables are super close to one another. It’s defintely not a romantic Italian restaurant by any means, but the food is so good and that’s why people go obviously. They bring you freshly-cut bread and a olive-oil garlic dip that is AMAZING. I could make a meal out of this! I couldn’t stop! I asked our server what he recommended as the best dishes, and after naming many, I decided to order the Spicy Shrimp Diablo pasta. It was shrimp with linguini in a spicy garlic tomato wine sauce. Great pasta dish. If you like spicy this pasta was so good. Lots of flavor, loved it! Little pricey though, $15.95 for a pasta dish is a little steep, but the portion was huge so it was well worth it! My friend (who recommended this place to me and has been there many times), ordered the Three Color Ravioli with chicken in a red and white sauce. The sauce on this was so delicious! Usually I order dessert, but after all the bread and pasta, I was so full lol. 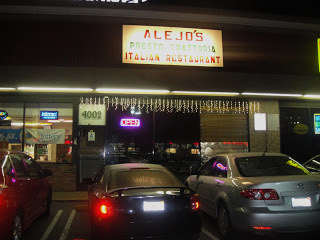 I would definitely go back to Alejos. It is a cozy hole in the wall with great Italian food. Highly recommended! Previous PostMAGNOLIA BAKERY, BANANA PUDDING! Next PostARNIE MORTON’S HAPPY HOUR!